"On the first pitch you have to climb up these 'psycho' bobbles of unconsolidated ice two feet deep and then sacrifice an arm to put in any protection" - is the start of the route description for Curtain Call (125 m, IV, WI6) in the guidebook. 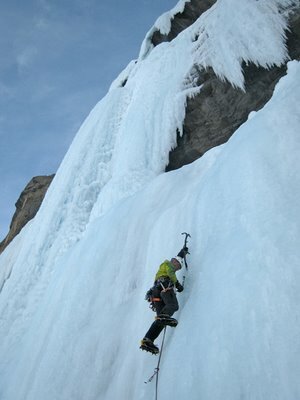 When Carlos Buhler suggests to climb the route today I thus have to swallow a couple of times. I like my two arms! 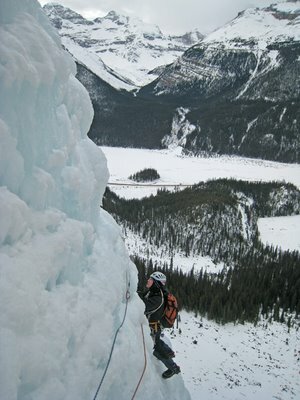 However, as the route remains to be one of the test-pieces of the Canadian Rockies, I am obviously tempted to climb the route! Thus, Carsten P. Cooper-Jensen, Carlos and I drive up there and when I see the route I have to swallow once again. The construction of a thin weird looking free-standing pillar on top of a heavily mushroomed free-standing curtain looks pretty unstable! However, as we get closer the route starts to look climbable - it IS possible to find a reasonable line up this thing on closer inspection! 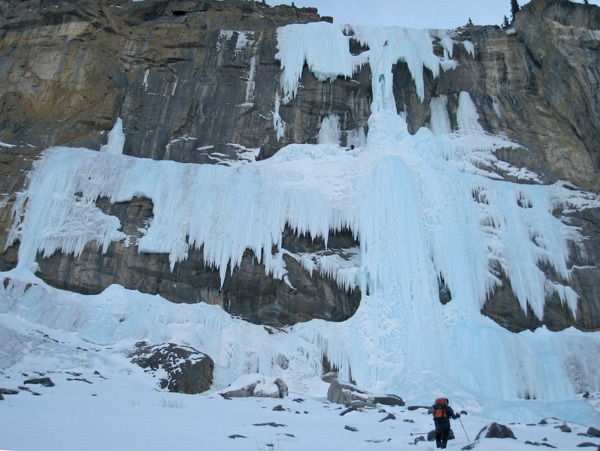 When we climbed Weeping Wall yesterday (read that story here), Carsten hurt the finger that got severely frostbitten on our climb of Bourgeau Left four years ago (read that story here). The hit on the finger has left it very sensitive and it is quite cold and weird reddish looking. 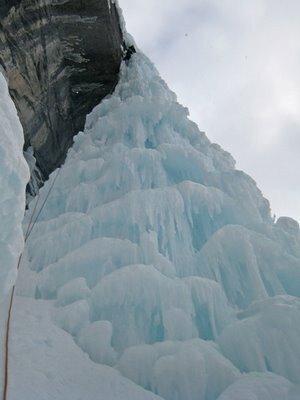 After leading the first step up to the start of the free-standing curtain he thus decides wisely to retreat from the climb and go back to the car. 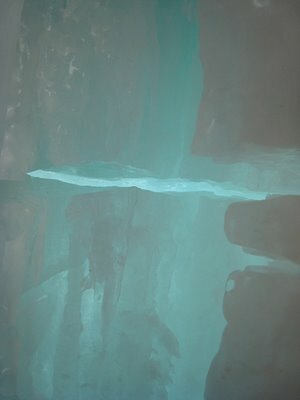 I climb out of a hole in the curtain on its right side and climb a vertical pitch of very interesting ice. Big mushrooms are negotiated by traversing back and forth, but most of the time I can climb in a groove which provide good stemming to the sides for my feet. Above I traverse to the left side of the upper free-standing pillar which looks to be easier than the right side. Most importantly, it was possible to find good ice screw placements without sacrificing my arms! 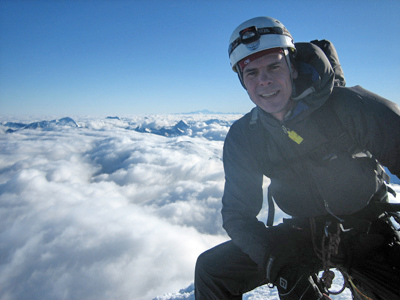 Soon Carlos joins me at the belay and start to climb the pillar. He chooses to climb it on the backside until he reaches the overhanging rock at which point he traverses to a groove on the outside of the pillar. Soon it is my term to follow and I easily climb the backside until I reach the rock overhang. At that time the climb changes psychology as I (1) notice a big 2-3 cm wide crack in the pillar where it connects with the rock (2) soon get a lot of air under my feet when I start climbing the groove on the outside. My forearms gets a bit pumped from climbing this section as the crack and air makes me grip my leash less ice axes too hard, but once I am in the groove I take the necessary time to get a rest and shake out where after I continue to the anchor. Carlos approaching Curtain Call. Note the climber far up on the upper pillar. Carsten leading the "step" up to the start of the free-standing curtain. Carlos seconding the traverse to the belay left of the upper pillar. Note the beautiful surrounding of the Icefields. Carlos at the mental crux of the route where the pillar was cracked and you had to leave the relative safety of the backside of the pillar and get "airborne".